Let’s start by asking why do many of us find it so difficult to reach out for support, especially in those times when we’re struggling? However one thing I find fascinating from my study of the Seerah is how consistently our prophet salla Allah ‘alaihi wa sallam turned to others for support. There was a time when our prophet had no one willing to sponsor him – his uncle Abu Talib was his guardian and protector, and he had passed away recently, and his other uncle Abu Lahab took over the leadership of his tribe and he was unwilling to protect the prophet. At that time the prophet was forced to go out to Ta’if to seek a people who would basically give him a visa to be one of their citizens. Things were difficult in Ta’if as many of you know, as the entire city collectively turned him away and rejected him. But he did not give up his pursuit to find the support he needed. When he returned to Makkah, he remained outside the city and sent messaged to various tribal leaders within the city, letting them know of his need and asking for support. At this moment where he truly was without the practical support he needed to continue his message, he was working hard to get it! I think we can learn from this to question our own hesitation to turn to others. (2) that kind of support just falls into your lap oftentimes in the form of a romantic partner that appears in your life and solves all your problems. People who are supported recognize the need for support and so they proactively cultivate and build their support network. Now if you’re here and that’s something you have NOT done in your life, well like I said I don’t blame you and you don’t need to blame yourself, Allah is giving you the opportunity and the blessing now to listen to this message and to do things differently. Now, relationships can be cultivated for various different reasons, but if you’re someone struggling with unwanted habits that are destroying your life, then a very important piece of your puzzle will be cultivating a relationship that allows you to blow your own covers in a moment of temptation. Now why is it important you have access to someone you can speed dial when you are feeling the urge to indulge? The bottom line is that staying in isolation is exactly what addiction and shaytan want, because that’s where the addictive thought patterns and behaviors thrive. When you reach out to someone it helps you balance out the extreme addictive thinking, and reconnect to reality. Often times in those moments of urges the stress and the anxiety is so great and it honestly feels like the world is going to end – I know you’ve felt that way before! But 100% of the time, things are not really as bad as our minds make them out to be. And just talking with someone helps you reconnect to reality. Finally, the unwanted behaviors are so often used to find comfort and solace and love when you feel uncertain and alone. Do they actually provide these things? Well, not in a true or lasting way, and at the end it leaves you empty. But you need to ask still how will I find comfort and solace and love when I’m no longer going to tolerate turning to these destructive habits? When you need comfort, the answer is turn to support people! It’s one of the most powerful ways to meet your needs in a healthy, halal, and uplifting way. Now the question is: who is it you’re going to reach out to? There are so many people you can include in your support network – friends, family, mentors, religious leaders, your spouse, a coach or counselor! And these people can support you with encouragement and validation and guidance. You want to shine a light on the inner addict so that you can interrupt the pattern before it leads to relapse. Now this is exactly why we put together the PYG Community, since we recognize people need access to THIS type of support. 1) Use what you’ve got! Even if you haven’t cultivated the ideal relationship, it doesn’t mean you can’t utilize the relationships you do have. You can open yourself to people around you, even if you can’t share with them all the details. My friends know when I’m having a hard time because when they ask me how I’m doing I tell them “AlhamdulAllah man, I’m struggling.” They may not know more than that, but at least I’m opening up the possibility to be supported in some capacity. 2) Start by supporting yourself. We often hesitate to open up to others because we’re afraid they won’t understand. The truth is, they might not! But if you stop and think to yourself hey, I’m valuable, I’m worthy, sure I’ve got these struggles but it doesn’t mean I’m an evil person… then the possibility of someone misunderstanding will seem less daunting all of a sudden. Which means you’ll be more willing to try, which means it’s more likely you’ll be pleasantly surprised when someone actually does get it! The other hesitation we often have in seeking support is we feel like I don’t want to be a bother. If you do have someone you can reach out to, you might think well sheesh I just called yesterday how can I call again today? But you may have forgotten that you actually have something to give as well. These people who you want to enlist their support, what can you give to them? Maybe it’s just your kindness, your smile. Maybe you just ask them how they’re doing how they’re family is doing. Give them some love and care – they will really appreciate that from you, and you’ll find more support coming your way when you need it. 4) Allah is always on speed dial. In the end, no relationship is going to be perfect and give you everything you need on a silver platter. So while it’s important you work to cultivate these relationships, it’s also important to recognize that when you feel alone, when you look at your contacts in your phone and you feel like there’s no one you can reach out to, you still are not alone even in that moment, because our only true speed dial is Allah. 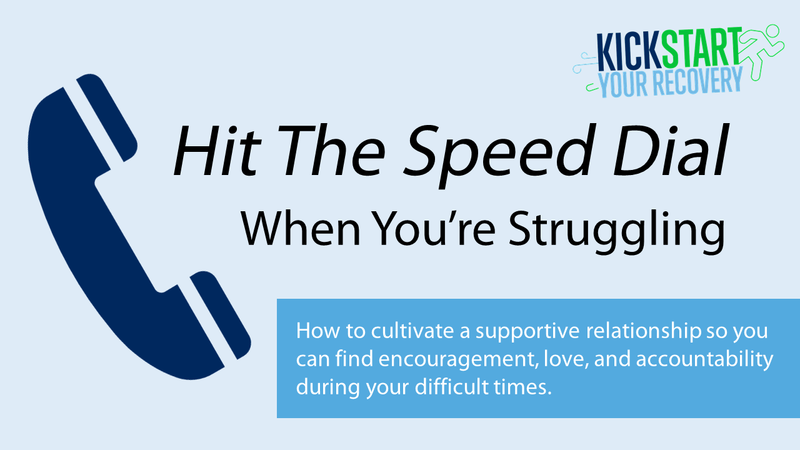 So use these tips in order to start TODAY cultivating supportive relationships in your life so that in those moments of difficulty you can find a source of comfort that will uplift you and help you connect to what truly matters rather than indulging. One thing that goes hand in hand with reaching out to someone in those moments is to take some steps yourself to find that calm and that emotional balance once again. And we’ve got an exercise we call “Standing Strong” that actually walks you through an exercise for you to calms yourself in a moment of temptation, and so before you log off I encourage you to get an even extra dose of protection and preparation. Download the exercise and give it a shot so that those moments of temptation can be turned into moments of victory, healing and growth, rather than indulgence, insha Allah. Thanks Bara I will put these to practice. May Allah continue to guide a right as well.